This chapter examines the effects of USA economic nationalism in the second-hand clothing (SHC) industry within Sub-Sahara Africa (SSA). The SHC industry creates an estimated 355,000 jobs in the EAC, which predictably generates incomes of US$230 million that supports an estimated 1.4 million people. The chapter looks at attempts by Kenya, Ghana, Nigeria, Zambia, and Rwanda, among other Sub-Saharan to curtail SHC to protect their infant or struggling textile industry through subtle economic nationalism policies. It then examines the repercussions of having Rwanda implementing the ban from US market. The study inspects why the Trump-led administration feels that the SHC industry is important to the US. Undeniably, the chapter will put forward a case for banning of SHC and why it is gaining notoriety in the Sub-Saharan Africa region. The chapter finally advises what managers ought to do in the wake of economic nationalism and American only policy in Africa. Chitrakorn (2017) observed that several East African nations moved to curb used clothing imports from the US to support the growth of the local textile industry. This came hot on the heels of a summit of the East African Community Heads of State. The summit, keen on promoting vertically integrated industries in the textile and leather sector, directed the partner states to procure their textile and footwear requirements from within the region where quality and supply capacities are available competitively. They did this with the aim of phasing out the importation of used textile and footwear within three years (2019). However, this may come at a cost given that USA views such actions as hurting American interest in view of billions of dollars the US is likely to lose. Hansen (2004) believes that the popular media routinely sensationalizes Second Hand Clothing (SHC) imports as destroying garment and textile manufacturing in the countries that receive them. The American First Policy however, coupled with tariffs levelled against other products, especially from China, have been viewed as pure Economic Nationalism by other countries. This is why President Trump does not take lightly any retaliation from the said countries that adopt protectionism tendencies against USA products. In fact Evans (2018) explains that while “America First” is Donald Trump’s favorite slogan, a version of “economic nationalism” owes its popularity to the failures of global neoliberal capitalism. It is in line with this that Baughn and Yaprak (1996) propose that economic nationalism is the adoption of an “us first” in the in-group versus out-group distinction relating to companies, products, jobs, and workers. They theorized that the craving to keep economic activities under domestic control encourages those who can play a role in curtailing the influence of foreign business in the domestic economy, to be bold and aggressive. Evans (2018) explains that “Economic nationalism” has a venerable history and can be traced from Alexander Hamilton to Friedrich List, to their twentieth-century successors in Latin America, Africa and Asia. Many officials in governments across the world have always tried to protect their economies from external shock and financial aggression. This has always been done through protectionism tendencies and economic nationalism. 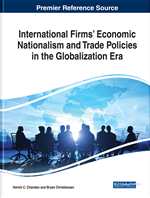 Consequently, Pryke, (2012) specifies that in a way, economic nationalism mean closing off an economy to external influences can be beneficial to growth and fiscal progress and be defined as a mixture of trade protectionism and economic planning. Economic nationalism is a set of policies that emphasize domestic control of the economy, labour, and capital formation, even if this requires the imposition of tariffs and other restrictions on the movement of labor, goods and capital. Labeș & Cuza (2001). “As a set of state practices, policies and strategies, often in concert with private capital and politically supported generally by organized labor to protect and promote national economic interests such as improving wages and incomes, fostering national competitiveness, promoting national champions. (D’Costa, 2012).